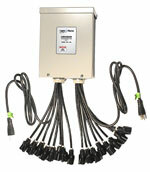 The LOR1602W is a 16 channel weather resistant light controller that can operate independently, operate as the director unit in a multi-controller network or as an add-on unit of a larger synchronized network of controllers. Each of the 16 independent channels has a number of special effects such as dimming, ramping, twinkle and shimmer. The LOR1602W is built in a weather resistant case allowing it to be used for your outdoor displays. The LOR1602W has a 30 Amp capacity.